You have a lot of options when it comes to storage in your garage. You can design overhead storage for large items you need to keep, but don't use often, or vertical storage for bikes and tools. Paint panels of pegboard for added design interest and practicality; hang them on the walls to take advantage of every available space. Add storage space in your garage with ceiling-mounted shelving, hooks and hangers. You can design the width and height of your ceiling shelves with metal bars attached to the ceiling joists and connected crossways with metal racks and braces. Adjustable bars give you height options based on the type of storage you need. Overhead shelves provide out-of-the way storage for holiday decorations and other large items like coolers and camping equipment. You can also find mechanically adjustable storage that you can raise and lower, as needed. Design your overhead shelving out of the way of the garage door opener. Metal hooks and hangers should also hang from the ceiling joists for storing ladders, bicycles or anything else that will hang vertically from the ceiling. Vertical storage, like cabinets and shelves, offers easy accessibility for items you use frequently. Consider a work space with closed storage underneath, combined with tall, vertical shelving racks on one or both ends. You can also store your bikes vertically with a special floor-to-ceiling rack for up to four bikes, stacked two high. Design your vertical storage based on the available space in your garage after you park the car. Make sure the depth of your cabinets or the placement of your bike pole does not prevent you from parking your car and opening its doors. Also make sure it does not interfere with closing the garage door. 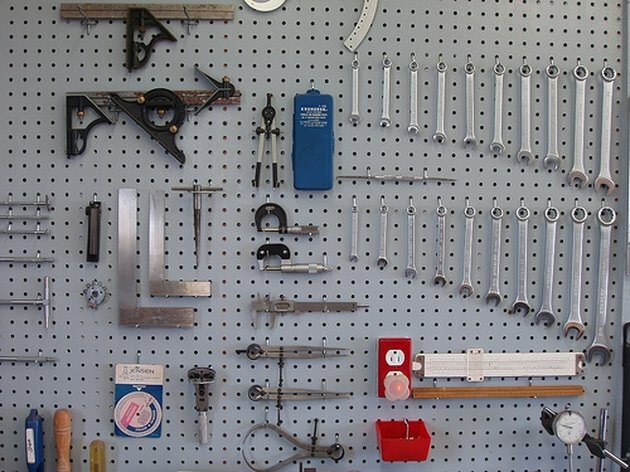 One of the simplest storage solutions in your garage is pegboard. You can run it around the perimeter of the room, in the center of the wall, or run it from the top of your work space to the ceiling. Paint the pegboard to add color and style to your garage space easily with alkyd primer and acrylic paint. If you begin with white pegboard, you don't need to prime it. Tape off a geometric design with painter's tape for added interest or paint it one solid color, whatever suits your garage design style. Select hooks for the pegboard to fit your storage needs.